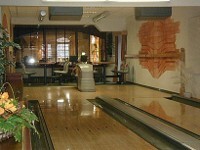 Are available two fully automated lanes with professional technologies Brunswick. On each lane can play up to 8 players. Seating for the player is on the same level as in the restaurant and allows pleasant and comfortable consumption. Play with us experienced players can both bowling and beginners or families with children. To diversify the experience of the game is possible to use UV light – the so-called GLOW effect. For children with special sliding track limits.